Summer is here – and we all know how important it is to stay hydrated on hot days! Infused Summer Drinks are the perfect way to refuel your body with healthy water that not only tastes good – but also looks so delicious! In the past days I have been taking a (glass) bottle with infused water with me literally everywhere – and hydrating has never been more fun! The positive side benefit of these pretty waters: Fresh fruits & herbs will make you want to sip all day! FUN FACT: Your body is composed of 65 percent water, most of it is located within your cells. Refuel your body with Pretty Waters that taste good, look good – and make you feel even better! This fruity summer drink is one of my favorites – almost like a healthy daiquiri, it tastes so good! First, puree the strawberries, then mix together with freshly pressed lime juice and sweeten with some agave syrup. Fill in a glass jar with sparkling water and fresh mint! For this tasty lemonade, you need melon, tonic water, cucumbers and fresh limes. I used a charentais melon (orange fruit flesh), but water melon is perfect too. I love the combination of hydrating melon and cucumbers! Cut the melon into pieces and blend in a mixer. Add freshly pressed lime juice and tonic water (or sparlking water). Strain through a sieve and add slices of fresh cucumbers! GO GREEN! with this smoothie-like summer drink you can`t go wrong. Blend chopped green apples, kiwis and cucumber with some water until the consistency is smooth. Add some agave syrup according to your taste and strain through a sieve. Water is LIFE. Give this essential element a kick by adding cucumber, lemon, ginger & fresh basil! The subtle flavours will make you want to drink all waters in the world – and must importantly keep you hydrated on any hot day! 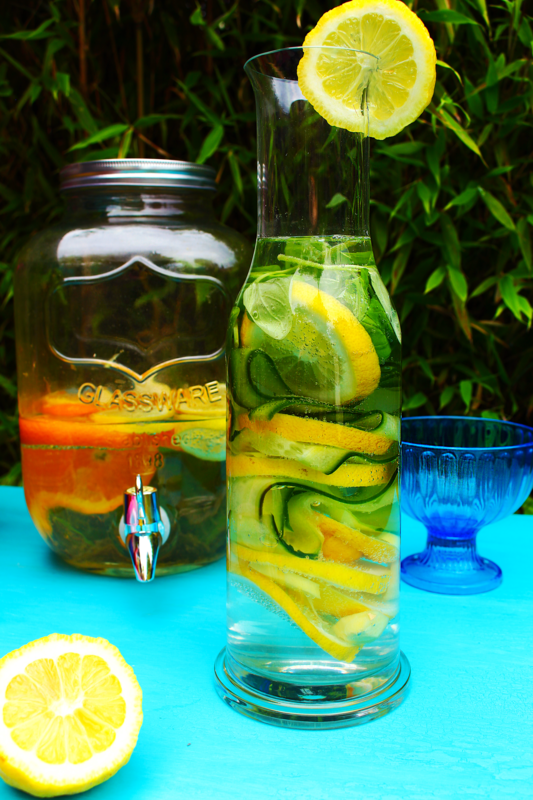 Fill a glass jar with cucumber slices, lemon, ginger & fresh basil leaves. Add sparlking water – and let the flavours do their magic! Serving Tip: Refresh the summer drinks with ice cubes for an extra cooling effect! As decoration, cut a cucumber with a peeler in thin slices lenghtwise, leave the skin to make it look even more appetizing! How do you stay hydrated in the summer time? Share your favourite recipes below! Posted in Food and tagged fresh herbs, Fruits, healthy, healthy summer drinks, hydrate, Infused Water, summer, Summer Drink, summer drinks, water, water with fruits & herbs. Bookmark the permalink.